The Consumer Price Index (CPI) moved up 0.3% in September, following gains of 0.5% and 0.5% in July and August, respectively. 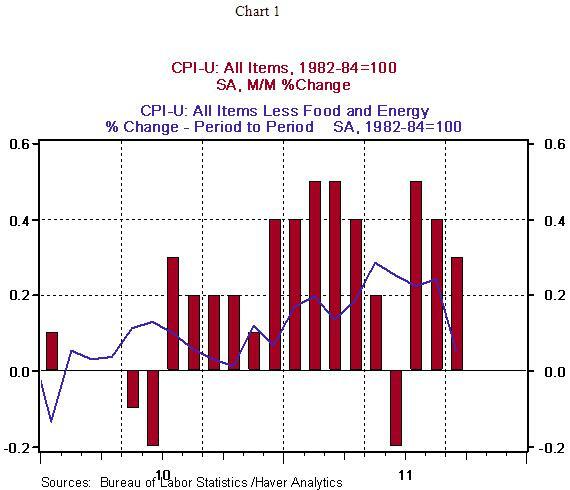 The core CPI, which excludes food and energy, rose only 0.05% in September after a 0.24% increase in August. The September increase is the smallest gain since March 2011 (see Chart 1). These signs of moderation in inflation are noteworthy because they allow the Fed to focus on growth in the inflation-growth debate. From a year ago, the overall CPI increased 3.87% in September vs. a 3.77% increase in August. 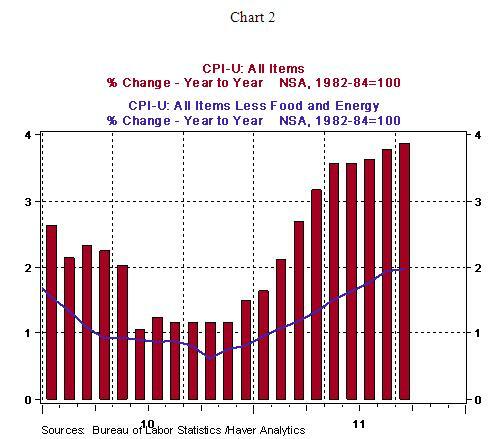 The core CPI has risen 1.97% from a year ago in September vs. a 1.95% increase in August. The core CPI appears to have reached a peak, for now. 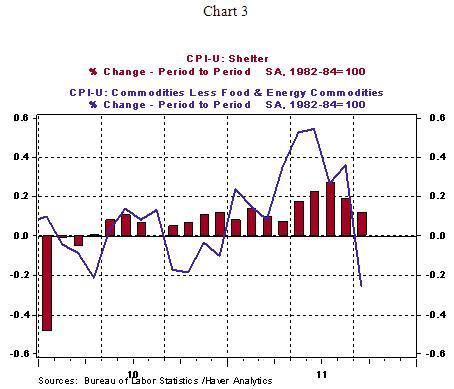 The 0.1% increase in shelter costs and a 0.2% drop in prices of commodities excluding food and energy were the two main factors holding back the core CPI in September (see Chart 3). In addition, the drop in the apparel price index (-1.1%) after four consecutive monthly increases and lower prices for used cars and trucks (-0.6%) following six months of large increases helped to contain the core CPI. Medical care costs advanced 0.2% in September, matching gains seen in each of the prior two months. The Fed holds the view that inflation numbers will show moderation, given projections of sub-par economic growth, which is somewhat supported by September data. 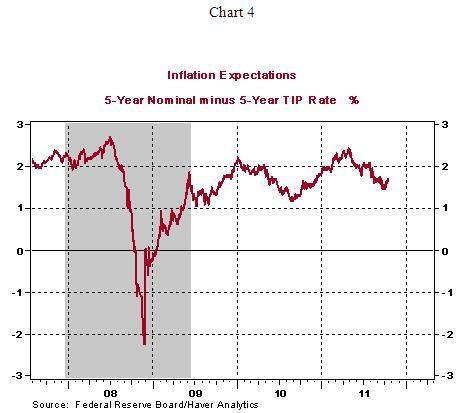 Monthly readings of the CPI and CPI core show a decelerating trend and inflation expectations (Chart 4) do not present a threat as yet. These signs of moderation should keep the hawks of the FOMC from voicing strong concerns about inflation. Sub-par growth and an elevated unemployment rate remain the major concerns of the Fed, for now.